Jay-Be have a new range of fabric sofa beds including luxury Retro style 2 seater and 3 seater fabric sofa beds and a Retro sofa bed chair all of which are available in luxury woven fabric with 20 colour options to choose from. The image above shows the Jay-Be Retro 2 seater sofa bed in Mink fabric. These are the Rolls Royce of sofa beds, UK made in Yorkshire, featuring solid steel welded frames with a lifetime guarantee, luxury deep sprung mattresses and a choice of 20 different British made woven fabric colour options giving a luxurious feel as as well as being a long lasting durable fabric. See further below for pictures of all the different colour options. We also offer the rest of the range of Jay-Be sofa beds and all their folding guest beds including contract folding beds. The Jay-Be Retro 2 seater fabric sofa bed is a 2 seater sofa that quickly turns into a 4ft double bed. This Jay-Be sofa bed is arguably one of the most luxurious sofa beds available today. 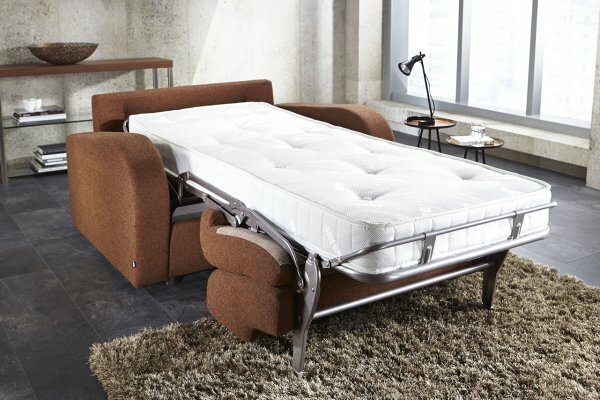 Its unique roll-out mechanism allows it to be transformed from a stylish sofa into a comfortable bed in seconds, without the need for removing the seat or back cushions. Boasting a full depth sprung mattress with sumptuous comfort layers, it’s just like sleeping on a real bed. The image above and the two images below all show the Jay-Be 2 seater Retro sofa bed in Mink fabric. The Retro sofa bed is also available in the full range of Jay-Be fabric finishes, click here to see them all. A 3 seater version is also available as is a sofa bed chair both of which are detailed further below. The images directly above and below show the 2 seater JayBe Retro sofa bed opened out as a 4ft double bed. To see how easy it is to turn the Jay-Be Retro 2 seater sofa bed from a sofa into a deep sprung double bed watch the short video below. (Approx 40 seconds). The dimensions for the 2 seater version of the Retro sofa bed can be seen in the diagrams below. The largest of the Jay-Be sofa beds is the Retro 3 seater sofa that quickly turns into a large double bed that is very nearly a king size mattress. This Jay-Be sofa bed is arguably one of the most luxurious sofa beds available today. Its unique roll-out mechanism allows it to be transformed from a stylish sofa into a comfortable bed in seconds, without the need for removing the seat or back cushions. Boasting a full depth sprung mattress with sumptuous comfort layers, it’s just like sleeping on a real bed. The image above and the two images below all show the JayBe 3 seater Retro sofa bed in Olive fabric. The Retro sofa bed is also available in the full range of Jay-Be fabric finishes, click here to see them all. A smaller 2 seater version is also available as detailed above and also a sofa bed chair which is detailed further below. The images directly above and below show the 3 seater Jay-Be Retro sofa bed opened out as a large double bed and is very nearly a king size mattress. To see how easy it is to turn the Jay-Be Retro 3 seater sofa bed from a sofa into a deep sprung large double bed watch the short video below. (Approx 40 seconds). The dimensions for the 3 seater version of the Retro sofa bed can be seen in the diagrams below. As you will see the sofa opens out into a large double mattress that is 144cm wide making it very nearly a king size mattress. The last of the 3 Retro sofa beds is the sofa bed chair that quickly turns into a small single bed. This Jay-Be sofa bed is arguably one of the most luxurious sofa beds available today. 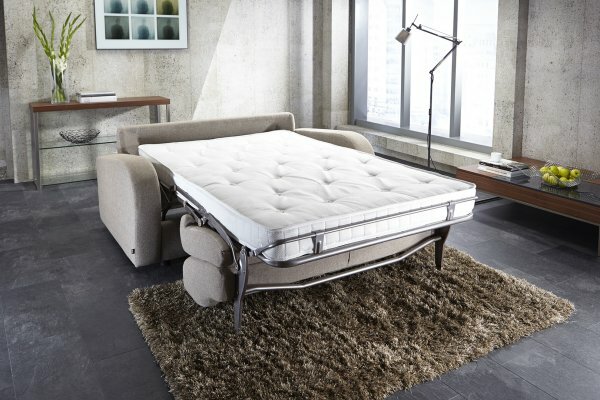 Its unique roll-out mechanism allows it to be transformed from a stylish sofa into a comfortable bed in seconds, without the need for removing the seat or back cushions. Boasting a full depth sprung mattress with sumptuous comfort layers, it’s just like sleeping on a real bed. The image above and the two images below all show the JayBe Retro sofa bed chair in Tan fabric. The Retro sofa bed chair is also available in the full range of Jay-Be fabric finishes, click here to see them all. A 2 and a 3 seater Retro sofa version are also available. The images directly above and below show the Jay-Be Retro sofa bed chair opened out as a small single bed. To see how easy it is to turn the Jay-Be Retro sofa bed chair from a chair into a deep sprung bed watch the short video below. (Approx 40 seconds). The dimensions for the JayBe Retro sofa bed chair can be seen in the diagrams below.